On your Mark, Get Set, Solve! Put on your running shoes, stretch out, and move over Cairo and Indonesia. The KO campus is the new terrain for The Amazing Race. 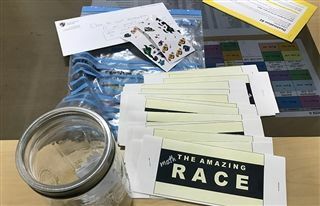 On January 16, students from Stacey Tomkeil’s Form 2 class participated in an assignment turned race - appropriately coined "The Amazing Math Race" - that kept them running (literally) around campus on a hunt for math problems. Students were in groups of three or four, and each of the five stops required them to find a location based on a clue. After the sprint to get there, the students rolled a die and the subsequent number determined which math problem they received instructions to solve. 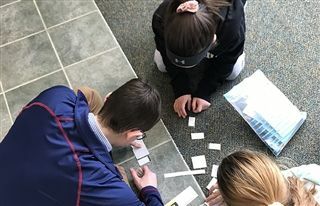 The group collaborated to solve it, and the KO staff member at the pit stop checked their work to ensure it was correct before they received their next clue. In addition, the KO staffer stamped in their passport for official documentation. Clues included: “She knows everything that happens at the Upper School, and still somehow manages to keep her cool. Down close to the buses she sits at her post, behind a window that looks out into a comfy place for most” and “She shares a name with a man who goes by Miles and she greets new prospects with large smiles. She sits at the desk with candy in a bowl, you may sometimes see her if you cut through to get out of the cold.” (Spoiler alert, KO’s also amazing Lindsay Perkins and Kim Miles). 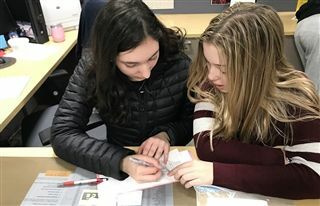 The activity was the student's final assessment after reading the book Frogs, Fleas and Painted Cubes, which focused on quadratic functions and equivalent quadratic expressions. The project is based on the CBS Emmy Award-winning reality series where 11 teams embark on a journey around the world. They are required to compete in a series of challenges, both mental and physical, and once completed will get their clue to the next one. Participants race against other teams and if they are the last team to arrive at a “pit stop,” they have the potential to be eliminated from the race. The last team standing at the end receives $1 million dollars in prize money. While students weren't awarded any prize money, they showed their seriously competitive math ability and illustrated the power of collaboration.